If you have a problem tooth we’ve recommended removing, those “Tooth in one day” ads—a tooth removed and an implant placed at the same time—might start to pique your interest. But there are a few factors we must consider first to determine if this procedure is right for you. Depending on your mouth’s health conditions, you may need to wait a little while between tooth extraction and implantation. Here are 3 timing scenarios for receiving your implant after tooth removal, depending on your oral health. Immediately. The “tooth in one day” scenario can be much to your liking, but it could also be tricky in achieving the best results. For one, the implant may fit too loosely—the bone around the socket might first need to heal and fill in or undergo grafting to stimulate regeneration. In other words, immediate implant placement usually requires enough supporting bone and an intact socket. Bone grafting around the implant is usually needed as well. After gum healing. Sufficient gum coverage is also necessary for a successful outcome even if the bone appears adequate. To guard against gum shrinkage that could unattractively expose too much of the implant, we may need to delay implant placement for about 4 to 8 weeks to allow sufficient gum healing and sealing of the extraction wound. 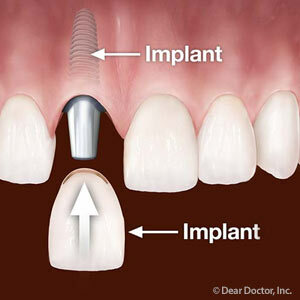 Allowing the gums to heal can help ensure there’s enough gum tissue to cover and protect the implant once it’s placed. After bone healing. As we’ve implied, implants need an adequate amount of supporting bone for best results. When there isn’t enough, we might place a bone graft (often immediately after tooth extraction) that will serve as a scaffold for new bone to grow upon. Depending on the degree of bone loss, we may wait until some of the bone has regenerated (about 2 to 4 months) and then allow the natural process of bone cells growing and adhering to the implant (osseointegration) to complete the needed bone growth. If bone loss is extensive, we may need to wait until full healing in 4 to 6 months to encourage the most stable outcome.